Takeaway: Manual processes? Siloed teams? Wrong, inconsistent product content? If you recognize these pain points, read on. In a webinar last week, Nasry Angel of Forrester Research and Arthur Werner, Director of Global Ecommerce Projects for Harman International, shared multiple hard-earned tips for implementing an efficient, nimble product content management system. Product content management (PCM) and product information management (PIM) can be frustrating processes, rife with excuses of why it’s just too difficult to maintain or keep up-to-date information. Nasry Angel from Forrester Research and Arthur Werner, Director of Global Ecommerce Projects for Harman International, have some thoughts on those very topics. Last week, the two experts shared their first-hand research and learnings, including how to effectively gauge the scope and implementation of new PIM systems, how PCM helps orchestrate work across parties, and best practices on how Harman, a company with over 50 ecommerce sites, was able to dramatically speed time to market and increase the accuracy of their content worldwide. 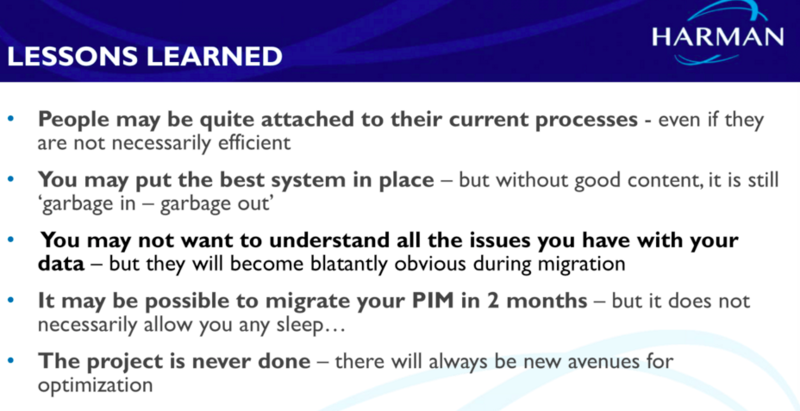 We’ve included a few highlights below, but left the meat of the webinar for you to check out yourself. Register now to watch it on demand. This change in business tides is largely due to technology and the immediacy customers expect in getting the information and products they want or need. It’s their world, we just live in it (and try to get them what they want). 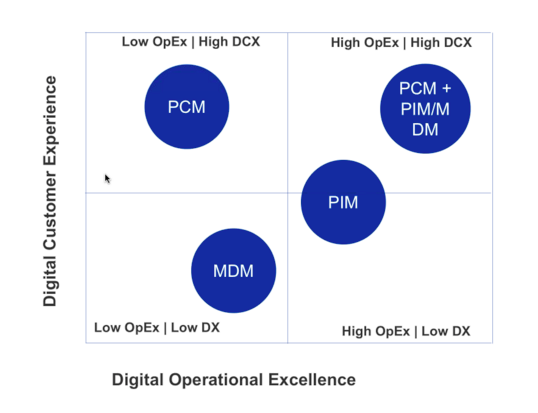 Below is the high-level slide, which shows that in order achieve excellence for digital customer experience and operations, businesses need a combination of PCM and traditional data management tools, such as PIM and MDM. Also during the webinar, Nasry shared how each specific need your company faces might map back to each system. About 82% of online adults find it important for retailers to refine search results by product attributes like brand, style, price, size offering, and color. In other words, they don’t just want the information, but they want to be able to save time by curating their own shopping experience. Managing product content and information doesn’t begin when the product is market ready. What Arthur and his team discovered was PIM/PCM began with the new product’s origination, so now when an item is created and added to a line, content and assets are loaded at the source and travel with the product from inception through development through the time it reaches online sale. Harman implemented Salsify to address these challenges. Arthur discussed the lessons he and his team learned throughout the process. Organized, up-to-date content is critical to capturing the attention of today’s digitally empowered customers. Learn more about the systems that work best to manage getting new content to market during our recent webinar.